Buyers looking to get behind the wheel of the bi-turbo Audi SQ5 can now place an order with their dealer, with delivery expected in spring 2013. Prices for the 155mph sport-SUV, and Audi's first S-badged diesel, start at £43,870 on the road. The heart of the SQ5's monster pace is its 3.0-litre bi-turbo TDI engine, which delivers 313PS (309bhp) at 3900-4500rpm and 650Nm (497lb ft) at 1450-2800rpm. Performance figures are interesting - 0-62mph in 5.1 seconds and a governed 155mph maximum speed. Timing and lift of the intake camshafts, the pistons, their oil-jet cooling and the piston pins have also been specially designed to cope with the additional power. Thirty years ago, those were the performance figures of a Porsche 911 Turbo. Now they're available in an off-roader. 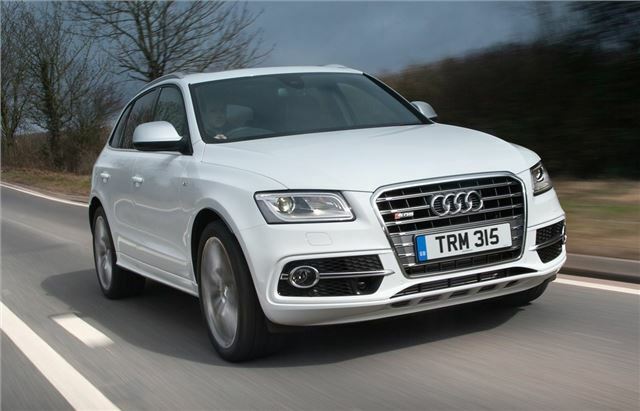 However, the SQ5's combined 41.5mpg and 179g/km are a world away, and class leading in today's market. The quattro all-wheel drive system is fed through an eight-speed tiptronic transmission, and all of that power and torque comes via two turbochargers, connected in series. Audi drive select is available, and offers a choice of Comfort, Auto, Dynamic and Efficiency modes. These modes influence the weighting of the electro-mechanical power steering, and the transmission shift points. We'll wait for the first drives to comment on the dynamics, but Audi says that with a 30mm lower ride height than standard, and 20-inch allloys, and sports suspension, the SQ5 TDI is nimble and handles in a sporting way, The optional Audi drive select adaptive dynamics system is specified will be the key to how well it works on UK roads. There will be no mistaking the SQ5 for its softer counterparts in the Audi range - big wheels, black brake calipers and a platinum grey single-frame grille with its galvanized aluminium-look double bars are subtle tell-tales. Also look out for the roof spoiler, the S-specific bumpers and quad tailpipes, all which add serious showroom appeal to a car that will undoubtedly find plenty of buyers in the UK - most probably because of the brilliant engine under its bonnet and its ample reserves of performance. I think a lot of people will! this is due to its cheapest made from other competitors..